DiRT's Daily 14SEP2K9 - Target Terror! DiRT takes a look back at the video he and Devall made to celebrate Konami's Target Terror on the Wii! DiRT's favorite music game of all time - AMPLITUDE! DiRT gives his review of the new Batman game on PlayStation 3! How does it compare to other super-hero games? It's Pixel Dan's first full-on video game review! See what he thinks about this late-released NES hidden gem! Pixel Dan doesn't just love toys, he loves video games too. Especially if they are 8-bit! 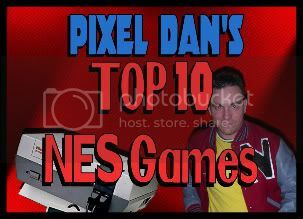 Check out Pixel Dan's Top 10 Favorite NES games! obviously forgetting how the internet works. Pixel Dan scored an UNOPENED Virtual Boy! When young folks gather around the campfire to tell stories of horror and woe, the usual fodder creeps up again and again: A man with a hook; a killer using the upstairs telephone. But with the new generation of youngsters growing up with video games so firmly established in society, it's only a matter of time before the words "Mortal Kombat Advance" reek terror into the hearts of pre-pubescent boys at fat camp.